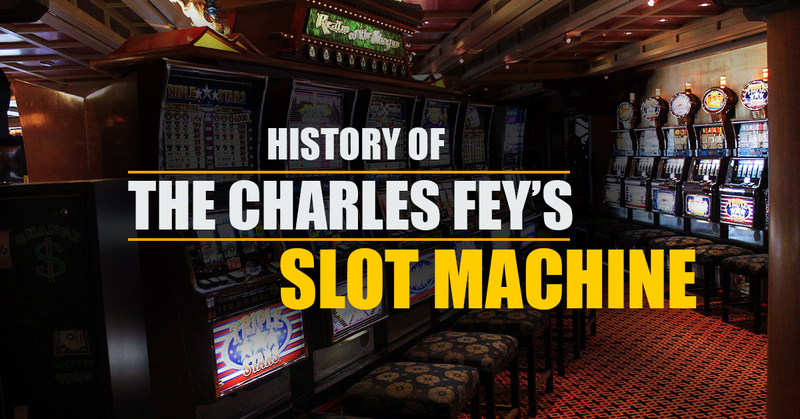 The San Francisco mechanic Charles Fey is commonly known as the man who invented slot machines, however, the exact time when it happened is not clear. Charles, who was a mechanic, invented this machine to entertain its customers who visited the shop to get their vehicles repaired. The machine instantly became famous and people used to wait in queue for their turns on the game. The casinos pick the idea and started providing slots to their users. This is how the modern slots were introduced. The slot machines available at today’s casinos are quite different from the original machines which only offered card games. Casinos expanded Fey’s idea to make slots more interesting with themes and multiple game options. Let’s take a look at the history of slots to know more about the conditions around which these machines were invented. Born in a family with 15 older siblings, Charles Frey had never imagined that he would become the inventor of the world’s most famous casino gaming machine. He was born in Bavaria and emigrated to New Jersey to live with his uncle when he was 23 years old. He was working as an instrument maker since an early age and had good skills in the industry. After some time, he settled in San Francisco and started his own company with a co-worker from his previous employer Electric Works. The invention of the slot machines took place as a byproduct of Frey’s efforts to bring more customers to his business. Like I said, Charles never intended to create a money-making machine or had no idea that he was actually developing a futuristic gambling equipment. The original machine had three reels and was based on cards. The game had the usual card symbols, including hearts, diamonds, and spades, along with a Liberty Bell and horseshoes. It was called the Liberty Bell Machine. It was based on the same concept of today’s slots which required players to achieve a row of the same symbols like three Liberty Bells in order to win. The game had an automatic payout system and became popular instantly. Even many other shopkeepers started keeping the copycat machines at their shops to gain from the popularity. Since the machine was operated through a handle, it was also sometimes called a one-arm bandit. The demand for Frey’s machines spread out of California, but he was no longer able to keep up with the demand, therefore, the State had to ban the use of machines. But even that didn’t stop the players from using these games. Frey also couldn’t get a patent on his invention because of the laws, so he eventually started renting his machines out to pubs, bowling alleys, cigar stores, salons, barber shops, and other places that were interested in them. To deal with the cheating players, Frey started using the detecting pin in his machines that could differentiate fake coins from real ones. The first slot machine factory was founded by Fey himself in 1896 or 1897 and this was the beginning of a revolution that hasn’t stopped yet. Almost every popular casino in the world started using slot machines since they were high in demand. Fey, as well as his partner, started making slot machines and selling to whoever wanted them. Fey’s grandsons opened the Liberty Bell Salon in Reno in 1958, which displayed many of his old slot machines including the very first Liberty Bell Slot. The salon closed in 1995, and the machine can still be seen in a Reno museum. Charles probably never thought that his small invention would go on to make the history and will be used by casinos for many years to come. The slot machines went through many changes and modifications over the time, and the result was the machine available at today’s casinos. The invention of online slots was the next big evolution in this field.